Fast to perform: It takes less than 20 minutes of hands-on time to purify 96 DNA sequencing products. No tedious vacuum drying process as is being used for 96-well plates with silica membrane or magnetic bead, is required. Easy to handle: All procedures have been optimized with standard 96-well PCR plates for ease-of-use. The major successive steps in the DNA sequencing workflow can be performed in the same plate, e.g. 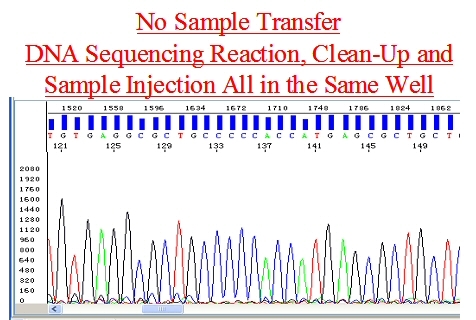 DNA sequencing reaction, sequencing reaction clean-up, product elution, and DNA sample injection on a sequencer, without a need for sample transfer. By contrast, multiple steps of sample transfer between different plates are required when performing the same work with 96-well silica-membrane or size-exclusion membrane plate. Since no membrane is needed for DNA binding or DNA size exclusion in the purification process, multiple steps of filtration in the sample binding/exclusion and washing steps associated with conventional membrane methods are eliminated, which makes the whole procedure very easy to perform. Reliable quality: Consistent well-to-well and plate-to-plate performance, reliable cross-contamination prevention procedure and unique solid-surface capture technology ensure high reproducibility, efficient removal of residual dye blobs and reliable reading of DNA fragment size of greater than 40 bases. Enhanced Stability: Samples purified with a Just-a-Plate kit are stable for more than a week at room temperature. This is ideal for long-term storage/transportation between different labs.